The photo pushed forward the idea of the stoic British continuing on with their normal lives. The appearance of German bombers in the skies over London introduced a new weapon of terror and destruction in the arsenal of twentieth century warfare. This concentrated direct bombing of industrial targets and civilian centers began on 7 September 1940, with heavy raids on London. It was the beginning of the Blitz – a period of intense bombing of London and other cities in Great Britain that continued until the following May. For the next consecutive 57 days, London was bombed either during the day or night. Fires consumed many portions of the city. The purpose was to demoralize the population and force the British to come to terms. The Blitz ended on May 11, 1941 when Hitler called off the raids in order to move his bombers east in preparation for Germany’s invasion of Russia. The above photograph was taken on October 9th after a German aerial raid. Photographers stationed in London were amazed at the total destruction wrought by German bombers yet their pictures were routinely blocked by the censors who were anxious not to cause a panic and also not to let the Germans know exactly where their bombs had hit. 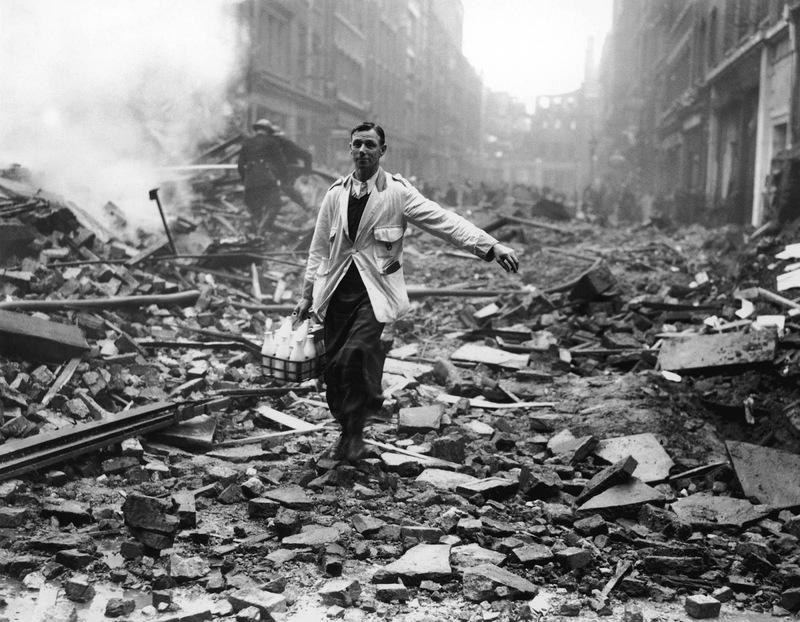 The photographer Fred Morley took the picture of a London milkman deliberately picking his way over the rubble. The only thing is that, in a way, the picture was staged. Morley first found a back drop of firefighters struggling to contain a fire then he borrowed a milkman’s outfit and a craft of bottles. He then got his assistant to pose among the ruins of a city street while the firefighters fought in the background. Morley’s thinking was that to circumvent censorship of demoralizing pictures of ruined streets, after more than a month of daily bombings, he should present things as an object lesson in the maxim “Keep calm and carry on”. The photo pushed forward the idea of the stoic British continuing on with their normal lives. The censors felt the same way and it was published the very next day. The government made a point that daily life will go on as normal as possible, that defiance was picked up and carried through to every single person, not only in London but everywhere that those bombs fell. By the end of the Blitz, around 30,000 Londoners would be left dead, with another 50,000 injured. The British government censored the bombing pictures particularly because the British were actively using countermeasures to disrupt the German navigational beams, resulting in Luftwaffe planes regularly bombing the countryside instead of cities for a few months. Publishing results of German bombings in newspapers would alert the Germans that the countermeasures were working. (Photo credit: Fred Morley / Getty Images. Original title: Delivery After Raid). In actual fact: on Churchill's orders Berlin was raided 6 times, during which on Hitler's order Goering was stopped from retaliating. Hitler still wanted to stop the 'Phoney War' but Churchill needed to trigger retaliation to convince his own populace for a real war - against Germany, mind you, not against Russia which had occupied the other half of Poland. Without Churchill there would not have been a European war, growing into a World War. Really???? So Invading Czechoslovakia, Poland, Norway and Denmark and launching attacks at sea in the autumn and winter against British aircraft carriers and destroyers, sinking several including the carrier HMS Courageous with the loss of 519 lives, action in the air on 16 October 1939 when the Luftwaffe launched air raids on British warships etc., isn't a real war nor a European war? I doubt if many will agree with you there. "Phoney war" (first termed by the Americans), it maybe called but war nevertheless. Also, YOU NEED TO GET YOUR FACTS RIGHT. The first bombing of Berlin took place on August 25th, 1940 well AFTER France, Belgium, The Netherlands and Luxembourg had been invaded, AND the Battle of Britain had started on the 10th of July. So....."NOT, in actual fact" !!!!!! !